If you read the label of virtually any commercial broth on the shelf at the grocery store, you’ll probably find loads of salt and—depending on the brand—crud. Canned broth can expose you to the hormone-disrupting chemical BPA. Food and beverage cans are lined with plastic which contains BPA. In adults, BPA has been linked to health problems such as heart disease, diabetes and liver problems. Although Tetra Paks may not contain BPA, they are lined with plastic. I don’t want my food—especially liquids—coming into contact with plastic. So, I make my own broths. 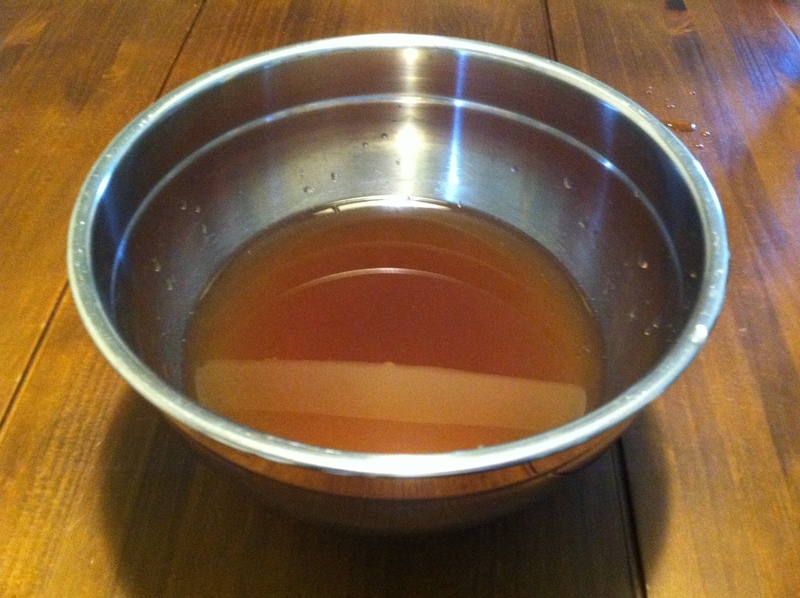 This post features vegetable broth. 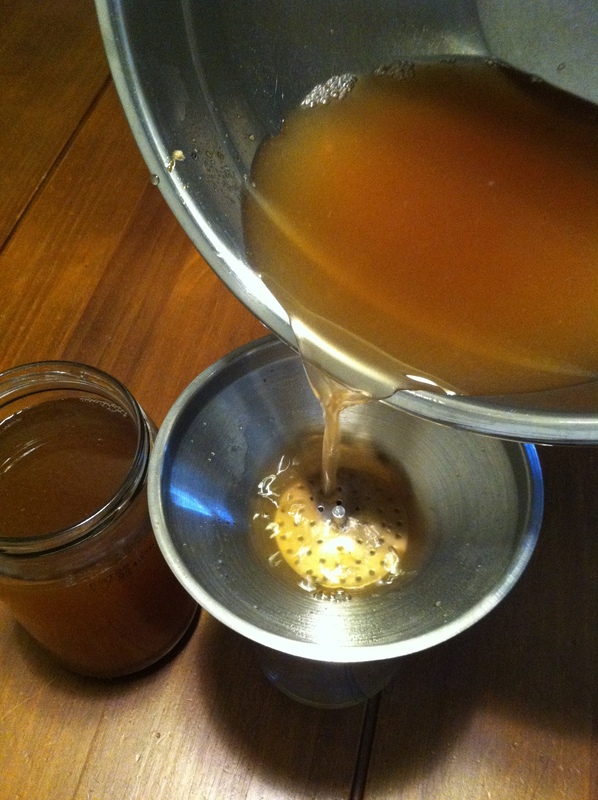 Click here for my bone broth recipe. 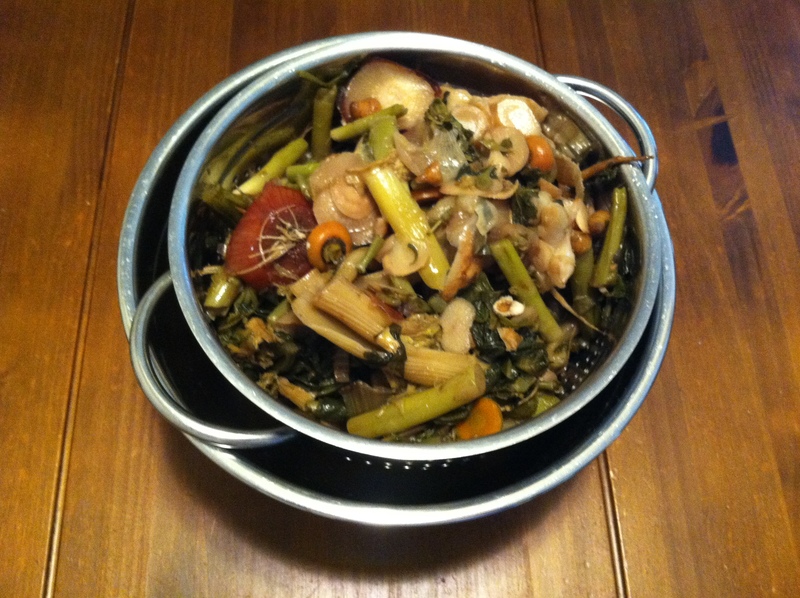 My vegetable broth recipe cuts down on waste on two fronts—the packaging and the ingredients. 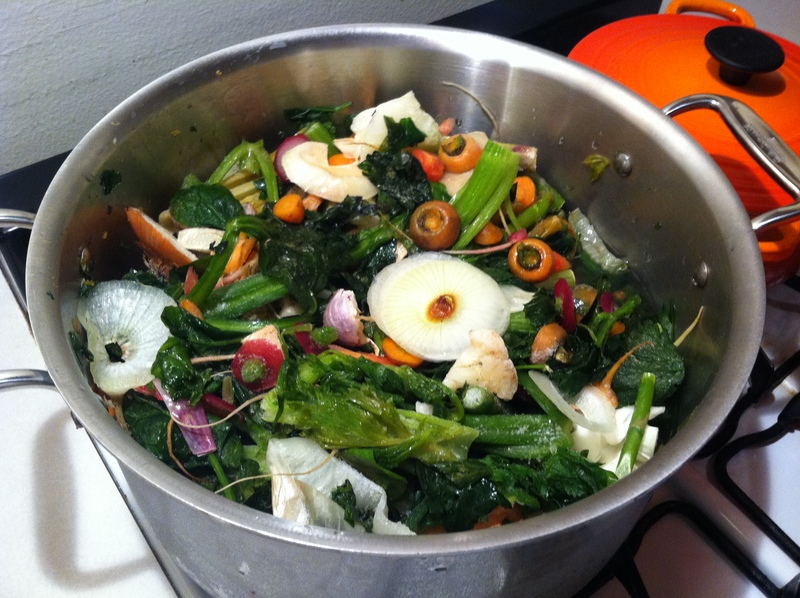 Throughout the weeks, as I prep my vegetables, I throw very little into my compost bucket. Instead, I save celery tops, carrot ends (not the leafy green parts—they may lend a bitter flavor), the ends of onions, cauliflower cores, garlic cloves that have begun to dry out, the ends of green beans, tomato cores, broccoli that has seen better days and so on. I collect these bits in glass jars and containers and freeze them. As I collect more scraps, they go into the jars. Once I have amassed at least a few jars’ worth, I make broth using the following recipe. 2. Simmer the scraps for about half an hour. You can add salt now but I prefer to make this unsalted and add the salt later to whatever I decide to cook. 3. Strain the scraps. 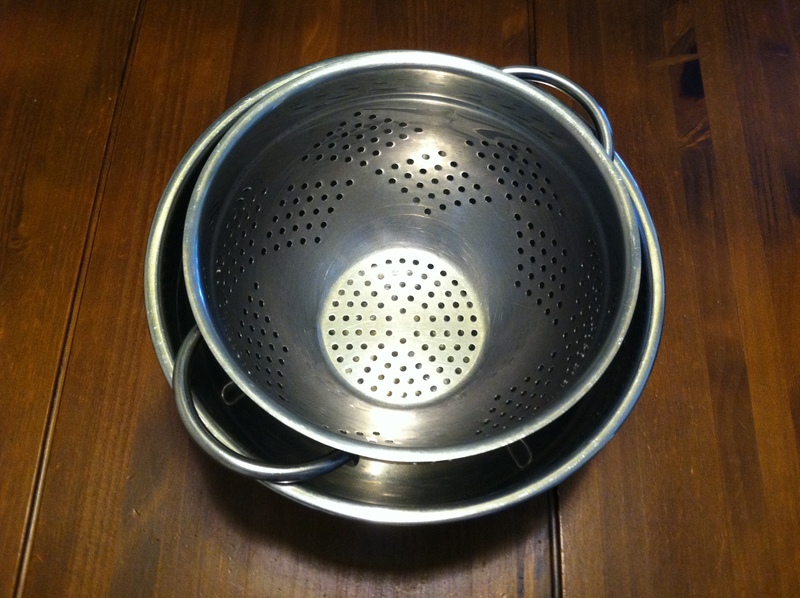 I set a metal colander inside a metal bowl and dump everything into the colander. Lift out the colander and reserve the scraps for the compost pile. 4. Pour the broth into jars. I have a handy funnel with a strainer in it but it doesn’t catch the super fine particles. You can also use cheesecloth. There you have it. 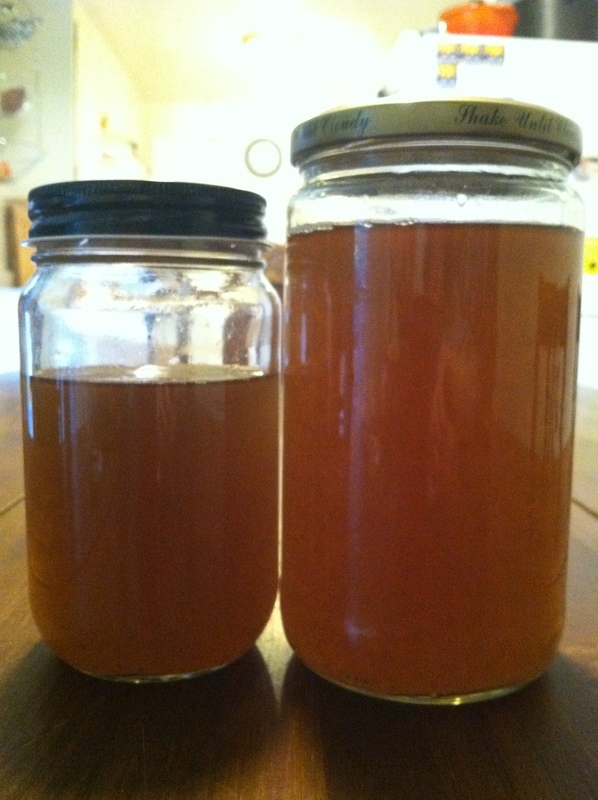 Two jars of tasty, healthier-than-store-bought broth that, aside from my time, cost me nothing to make. 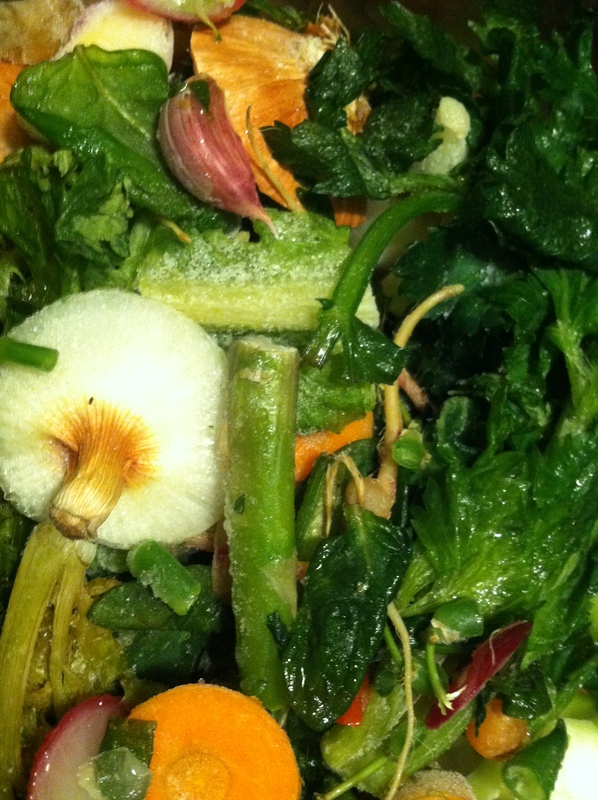 I threw nothing into the trash, and even these food scraps didn’t go to waste. I’ll probably use some of my broth for this Alton Brown baked bean recipe and for creamy vegetable soup. This didn’t even cross my mind. By the time you collect enough jars, has some of that food begun to spoil? And how long does the broth last? Thank you! I would say the broth stays good for a couple of weeks, but I almost always use it up right away (or at least within a week). Last night, for example, I made Spanish chicken and rice and when I assembled the ingredients, I realized I had no broth! So, I pulled my scraps out of the freezer (luckily I had enough) and made some just in time. What kind of metal funnel/strainer do you have? Where can you buy one? I love it. I use it to for bottling my kombucha and kvass and for so many other things. Awesome, definitely going to try this! It’s SO easy! And basically free! One could just freeze the broth, right? Maybe in cube trays and then into jars? Yup! I do that Adi. Sometimes I freeze it in jars but I prefer to freeze it in an ice-cube tray. Once it’s frozen, I transfer the cubes to a glass jar. Can you use other things? Like carrot and potato skins I peeled? Sure Kim. I use carrot peels, potato skins, little bits of tomato, garlic that’s too small to bother peeling…all sorts of vegetables. I just avoid anything bitter like chard. 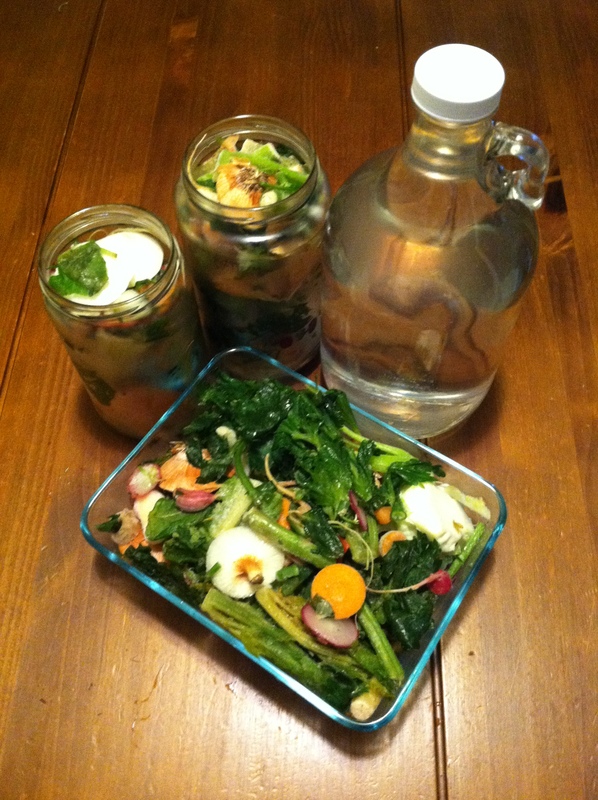 I was thinking about adding egg shells to the broth, what do you think? As a vegetarian, I don’t make bone broth, so I thought that egg shells can enrich my vegetable broth with calcium and other minerals. Also, are there any don’ts to put in the broth that can spoil the taste? I made a batch and it is OK, although I would not call it delicious. I plan on adding it only in small amounts to my meals, I would hate the idea of throwing it out, but I am also afraid of spoiling the taste of my food. 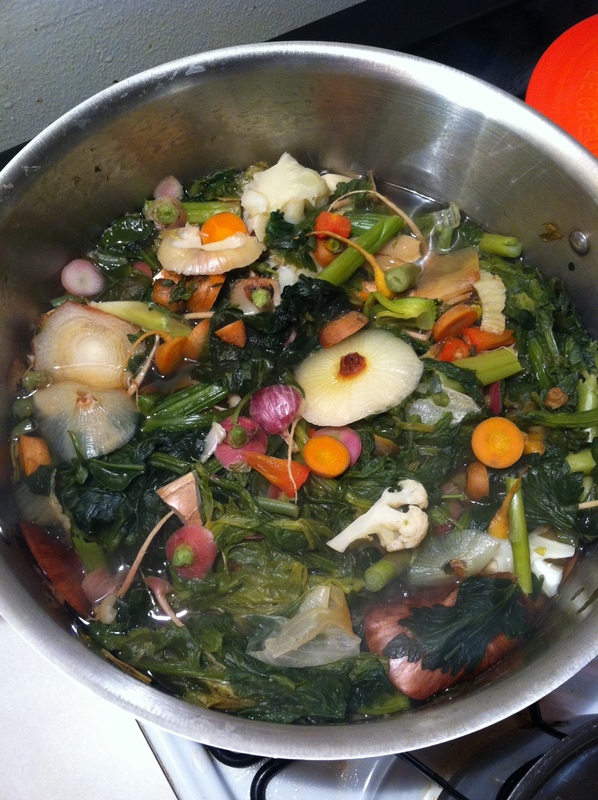 Hi, Anne-Marie, I have tried twice to use veggie scraps for making veggie broth, but both times they came up bitter. I was wanting to know if you had ever run into this. I am not sure what is making mine bitter, but it is gross. I have onion and garlic skins, leftover potato peels, carrots, maybe some chard (? ), some asparagus spears… Has this happened to you before? What should I be avoiding? Thank you! I live in an apartment and vermicompost. I was wondering if the vege scraps could be given to my worms after I made the broth. I don’t give them anything that has been cooked with oils or ghee, but that wouldn’t be the case with this, and I wouldn’t add salt until later.